Amphibians are cold blooded, breathe air through their skin and do not have hair or scales. Amphibians go through a metamorphosis; starting from an egg, morphing into larvae that is typically aquatic, breathing by gills, and growing into semi-terrestrial adults that breathe by lungs and through moist skin. Amphibious means ‘belonging to both land and water’ - but not all amphibious creatures are amphibians. Marine iguanas, sea snakes, crocodiles and pond turtles are all amphibious but they are considered reptiles because they do not go through a metamorphosis. They also have scales; amphibians have no scales. While both amphibians and reptiles come from eggs, amphibian eggs need to stay moist or wet as they develop and are usually laid in water. Amphibians include frogs, toads, newts, salamanders and caecilians – who resemble earthworms or snakes and hide in the ground, making them the least familiar of amphibians.. Most amphibians eat small animals like insects. Amphibians are divided into 3 major groups; salamanders, frogs and toads. Amphibians have the sad privilege of being endangered more than any other animal group. At least 30 percent of all amphibian species are now threatened to disappear. Toads, frogs, and salamanders are vanishing due to animal agriculture, habitat loss, air and water pollution, global warming, UV light exposure, disease, and the introduction of exotic species. Because this group of animals is overly sensitive to environmental change, they should be regarded as the canary in the global coal mine. 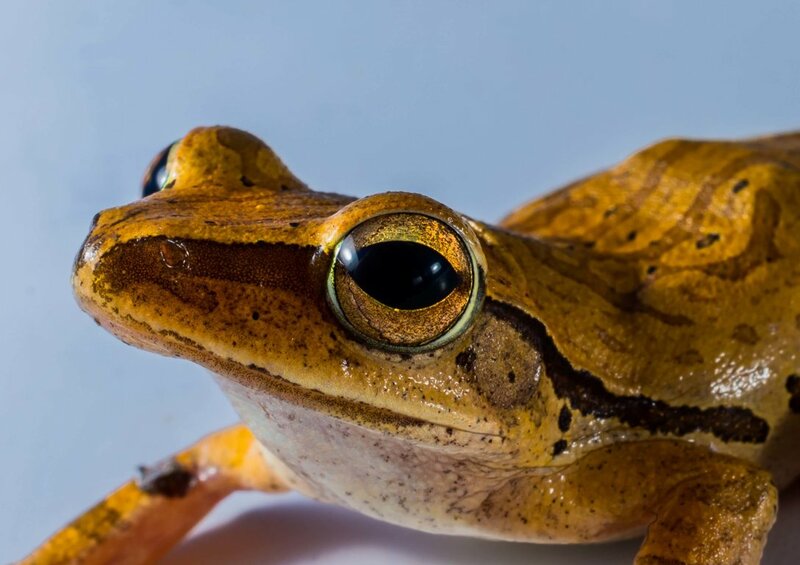 Amphibians alert us to minor but definite changes in the ecosystem that could lead to the extinction of many more species, not excluding humans. The largest amphibian is the giant salamander at 4 feet 8 inches long. The giant salamander is also the heaviest, weighing in at a whopping 88 pounds. The smallest amphibian in the world is a frog from New Guinea, Paedophryne amauensis, at only 0.30 inches. The fastest amphibian is an Andean salamander, which can travel at speeds of 15 mph. The giant salamander lives the longest, over 50 years. Baby amphibians hatch from eggs in water, starting off as polliwogs or tadpoles with no limbs and breathing through gills like fish. Some amphibians care for their eggs and babies, while others abandon their eggs in water and offer no care. When amphibian eggs hatch, the babies do not look like their parents. They start off as a larva, then undergo metamorphosis to transform into an adult form. Some amphibians, like toads, the process of going from an egg to a toad may only takes a few weeks. For others, like bullfrogs, the process may take two years. Giant South African bullfrogs are devoted fathers who have attacked lions and elephants while defending tadpoles. Some male frogs in the rainforest, who send messages by drumming with their feet, are the sole caretakers of their young. After the mother lays eggs, the father guards the nest and carries his children on his back.